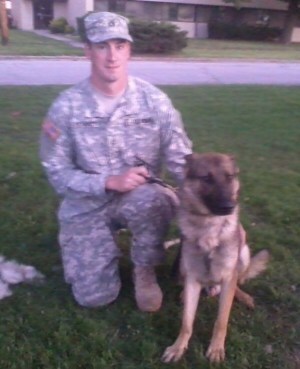 Brent Grommet, a Missouri army specialist assigned to the 101st Airborne, had been serving in Afghanistan with Matty, his loyal military working dog from the fall of 2012 through the summer of 2013. Matty was Grommet’s only dog companion during his deployment and the two trained together, served together and were ultimately injured together by IED’s on two separate occasions. Matty and Grommet worked tirelessly to detect hidden bombs and no doubt saved the lives of numerous American soldiers by instead putting themselves at risk. Their injuries in the field became severe enough that they were sent home. But even on the return flight, their bond was so strong that Grommet slept on Matty’s container. Upon returning, Grommet filed the proper paperwork to adopt Matty. Thanks to Robby’s Law, enacted by President Bill Clinton, service men and women such as Grommet have first right to adopt their military working dogs. Signed into law in November of 2000, Robby’s Law declares priority adoption rights first to former handlers, then to law enforcement and lastly to families and other individuals who want to adopt these special dogs. Grommet delivered the application to K2 Solutions, the government contractor in charge of Army canine issues, and waited patiently. Then the unspeakable happened. Grommet suffers from traumatic brain injury, spinal-cord injury, hearing loss and PTSD as a result of his service in Afghanistan. On top of all this, the military threatened Grommet with prison time at Leavenworth for simply speaking out about Matty’s theft. Let’s demand Matty’s return. Shame on K2 Solutions for allowing this to happen and shame on the individual who took Matty for himself. Given Grommet and Matty’s service, we have a legal, humane and moral obligation to reunite them. By sending the following email direct to the Army, we can demand that all members of the military adhere to Robby’s Law. Spc. Brent Grommet was unlawfully denied his right to adopt his military working dog, Matty, in direct violation of Robby’s Law (10 U.S.C. 2583). 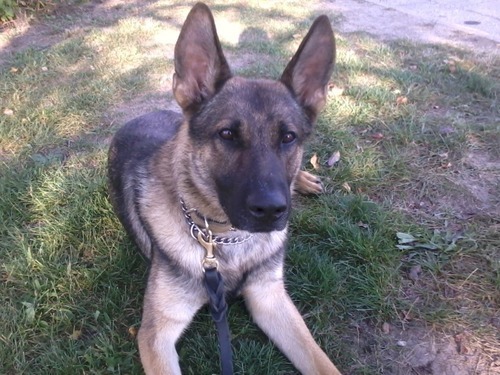 We ask that you investigate his dog’s possible theft by another soldier whom Spc. Grommet has been peacefully attempting to reason with. Many concerned citizens such as myself are outraged and disgusted that a wounded veteran and his veteran dog are being treated in this unacceptable manner outside the confines of the law. We hereby demand that Matty be promptly and legally returned to Spc. Grommet. Our veterans and their veteran military working dogs share a sacred bond that no one should be allowed to break. Let’s honor it now, we can do it.